For background on the clips, see the "Preparation" thread. All samples are FLAC and under 30 seconds. 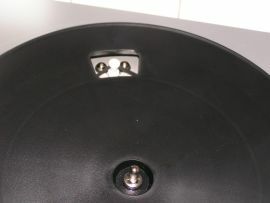 The Ion TTUSB05 gave every indication that it would be a step down from the Audio-Technica USB turntable. From a plastic platter to not publishing any specs to a generic MM cart compared to an Audio-Technica cartridge to the cheaper price. 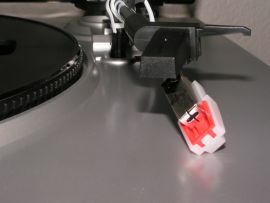 Opening it only reinforced my doubts: The cartridge had fallen off the head of the tonearm and the stylus had slid off the cartridge (See photos below). 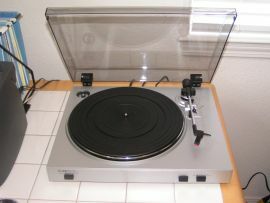 After putting it to work, though, it is the better of the two turntables, IMHO. First off, the cartridge comes in at 3.08 grams of tracking force. Watching the meters during the test records, the stereo balance is obviously much better. Finally, the gain is apparently set lower- I didn't encounter clipping during any of the music samples. One more fun thing I found reading an Amazon review: The counterbalance is actually adjustable using a screwdriver. I lowered the tracking force by a half gram - to 2.58 (after creating all of the other samples at the manufacturer's VTF, of course) and created a new Rhiannon sample. It didn't skip any worse at the lower tracking force. At around 2.35 grams, the weight becomes a bit unstable in its plastic casing and at less than 2.2 grams, it rests on the casing. One more fun thing I found reading an Amazon review: The counterbalance is actually adjustable using a screwdriver. It occurred to me that adjusting the counterbalance and setting anti-skate go hand-in-hand. Since the TTUSB05 doesn't have an anti-skate adjustment, maybe easing up the stylus pressure isn't such a good idea after all. With that in mind, I created two more samples using the 12db and 18dB anti-skate tracks from HFN002, in case anyone is interested in comparing. The first is at 2.58g VTF and the second is a remake back at 3.08g, the way I found it originally. I apologize for bringing up an old thread, but I'm new to vinyl and have a few question. I have an ion turntable as well. I have some problems with distortion on some of the louder records I have during regular playback and through a line-in recording (my computer won't support the USB software). 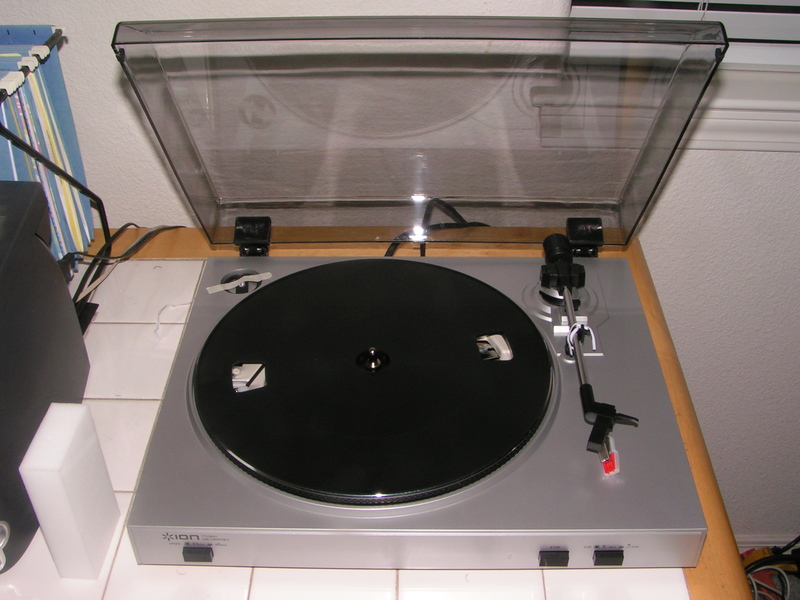 Would adjusting the counterbalance help with this at all, or is it the record itself that is distorting (and would that be something that's typical of vinyl)? Moderation: Removed useless quotation of the previous post. I have some problems with distortion on some of the louder records I have during regular playback and through a line-in recording (my computer won't support the USB software). The most important thing to check here is that you have the line-in levels adjusted correctly during recording. It is pointless to even consider any other possibilities until you are certain that this part is correct. The most important thing to check here is that you have the line-in levels adjusted correctly during recording. The obvious one is setting the recording volume through Windows Mixer. The second is more subtle- you need a "line level" signal to run the turntable to your computer. 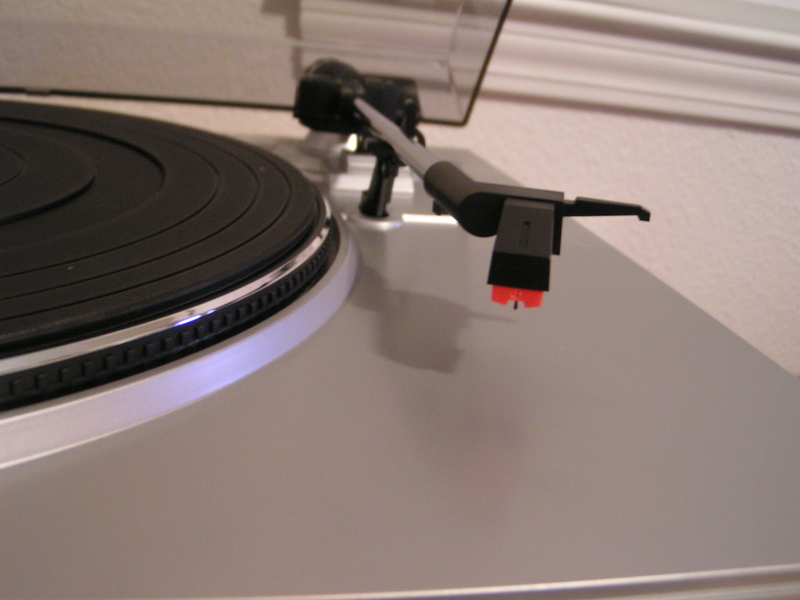 You didn't mention which Ion turntable model you have. But 4 out of 7 of them have a switchable pre-amp. You need to make sure that switch is set to "Line" and not "Phono." Would adjusting the counterbalance help with this at all? If some play albums play fine and "louder" albums are distorted, the counterbalance is not likely the problem. The TTUSB05 doesn't have anti-skate and you're not really supposed to adjust the counterbalance. There are no markings on the weight, so if you were to attempt it, you really should have a tracking force scale to make sure you're in the cartridge's range: 2 - 5 grams. Had a listen to the Steely Dan samples of this tt versus the AT and the CD. I agree that it sounds better than the AT, and sounds high-enough-fi for my ears, but man is it ugly! Personally, I need good looks with my sound. I do give the built in phono stage and usb interface a tick each for convenience.